1) New Zealand is a geologically active area where the Pacific Plate and the Australian Plate are meeting each other. Graeme BLICK, Chris CROOK, Nic DONNELLY (Land Information, NZ) and John BEAVAN (GNS Science, NZ) are reporting on the dramatic impact of the 2010 (Canterbury) Earthquake on the Geodetic Infrastructure in New Zealand. Before the earth quakes happened there was already a fully implemented geodetic Infrastructure in place. On one hand over 1 million geodetic and cadastral marks are affected within 60 km of the earthquakes epicenter where significant ground movements occurred. On the other hand these marks can be used for a detailed and long-term deformation analysis. This article does also underline the need and importance of our profession to the society. On 4 September 2010 a magnitude ~7.1 earthquake struck 30 km west of Christchurch near Darfield in the South Island of New Zealand. This was the most damaging earthquake to affect New Zealand in almost 80 years. The earthquake produced a ~30 km long surface rupture with up to 5 m of horizontal displacement and 1 m of vertical movement. 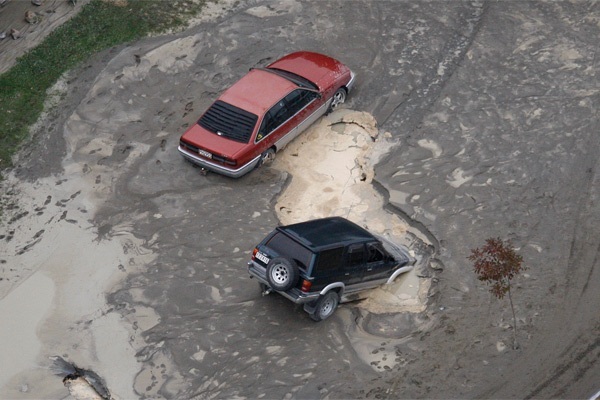 The shallow depth of the earthquake produced some of the strongest ground shaking ever recorded in New Zealand and resulted in areas of liquefaction and severe ground damage locally. The area affected by the earthquake consists of the flat alluvial plans of Canterbury and includes the city of Christchurch and several smaller surrounding towns. The rural area is highly developed with peri-urban lifestyle blocks and intensive rural farming. The ground deformation associated with the earthquake caused damage to utilities such as water and sewerage, particularly in areas of liquefaction, and has had a major impact on the cadastre, especially near the fault rupture. Changes in levels have also raised concerns about the potential hazard of increased flooding due to the low lying nature of the topography. The earthquake has also had a major impact on the geodetic infrastructure used to fix the positions of cadastral boundaries, utilities and flood management projects. Geodetic surveys were undertaken immediately following the earthquake and in the subsequent months to quantify the ground deformation caused by the earthquake, and its impact on the geodetic and cadastral infrastructure in the area. The Canterbury region of New Zealand’s South Island experienced a magnitude 7.1 earthquake on 4 September 2010. The earthquake was centred near the town of Darfield, about 40km west of Christchurch, the South Island’s main city (Fig. 1). Christchurch, with a population of 390,000, is the second largest city in New Zealand. The Canterbury region surrounding Christchurch is principally alluvial plains with small townships as residential commuter towns for Christchurch or supporting agricultural or horticultural activities on the Canterbury plains. The depth of the earthquake was relatively shallow at about 10km. It caused substantial damage to property and infrastructure, but no loss of life. Across parts of Christchurch, liquefaction caused localised areas of subsidence and lateral spreading. The earthquake occurred in an area that has previously had few earthquakes relative to other parts of the South Island. 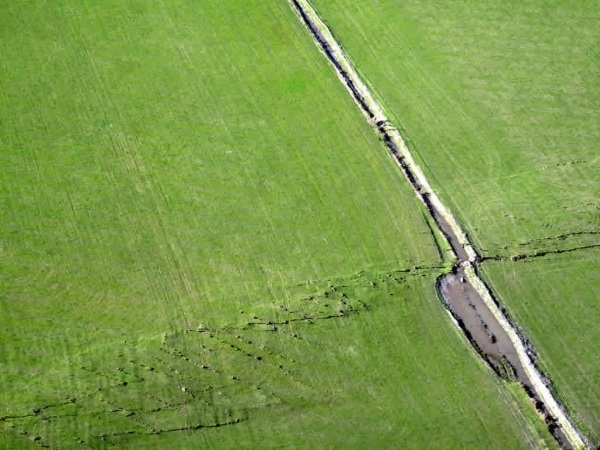 A fault rupture associated with the earthquake, named the Greendale fault (Figs 1and 2), occurred along a previously unknown fault and resulted in a surface rupture of several metres. New Zealand lies across the obliquely convergent Australian and Pacific plate boundary. In addition to the plate motions, New Zealand experiences the effects of other deformation events such as large earthquakes, volcanic activity, and more localised effects such as landslides. To accommodate the effect of crustal motion, New Zealand implemented a semi-dynamic datum, New Zealand Geodetic Datum 2000 (NZGD2000), in 1998 (Blick et al 2003). This datum includes a deformation model to convert geodetic observations made at different times to a common reference epoch of 1 January 2000 to accommodate the effect of crustal dynamics. The impact of events such as the Darfield earthquake are managed using a patch (Jordan et al., 2007) to ensure that the effects of the earthquake can be modelled and the accuracy of the datum maintained. The New Zealand Survey Control system is divided into a number of networks, each of which serves a different purpose (Donnelly and Amos, 2010). LINZ also maintains a national continuously operating GNSS network of 34 stations (CORS) which is used to monitor the dynamics of New Zealand and provide real time positioning services to users. New Zealand cadastral boundaries are defined by survey. For about 70% of parcels, principally in urban and peri-urban areas, the cadastre is connected to the geodetic network and is referred to as survey-accurate – this could be termed a geodetic cadastre. Geodetic, cadastral and title data are managed in an automated digital database called Landonline. Landonline is an observational database that enables the readjustment of coordinates as new or improved data comes to hand. Since the introduction of NZGD2000 there have been substantial earthquakes that have compromised the accuracy of the datum. However, to date these earthquakes have been located in isolated parts of the country, where population levels are so low that substantial efforts to re-establish the control system have not been deemed necessary. The Darfield earthquake changed this, centred as it was in a major agricultural area near the city of Christchurch. Thousands of geodetic marks and millions of cadastral marks are estimated to have moved by significant amounts. 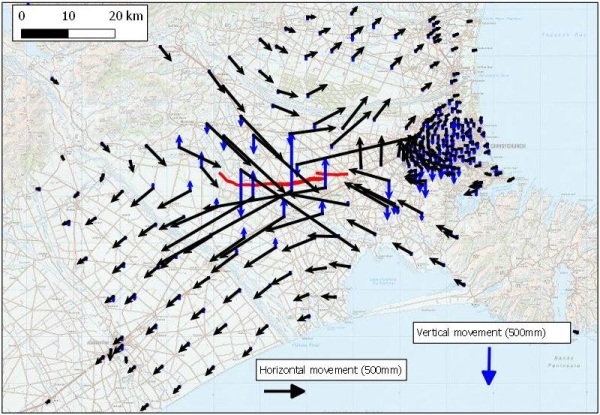 This article outlines the impact of the earthquake on the spatial accuracy of the geodetic infrastructure and cadastre and the steps proposed to update their accuracy. An extensive network of geodetic survey marks existed prior to the earthquake across the Canterbury region. Donnelly et al 2011 provide detailed descriptions of the surveys undertaken pre and post earthquake. Pre-earthquake high accuracy survey data from the 1990s were collected as part of the establishment of NZGD2000. A particularly dense network of marks was available across Christchurch city. In addition, one of the LINZ CORS stations operated close to Christchurch. These data were supplemented by data collected from other agencies including private surveyors. An immediate post-earthquake survey was undertaken by GNS Science to determine the extent and magnitude of co-seismic displacements. The data were used to determine the initial extents of both horizontal and vertical deformation associated with the earthquake. This and differential InSAR data were used to determine a preliminary source model for the earthquake (Beavan et al 2010). 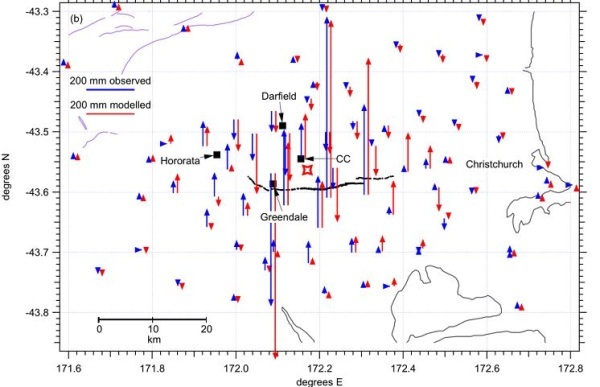 The results showed that the deformation as a result of the earthquake was able to be well modelled by displacement occurring on the strike-slip Greendale Fault and several other fault segments (Fig. 3). Once subsequent surveys confirmed that post-seismic movement was subsiding, work commenced on more extensive surveys by LINZ to resurvey 190 marks which comprise the LINZ existing 1st-4th order networks across the affected area. Control for this survey was provided by the marks surveyed during the earlier deformation survey by GNS Science. 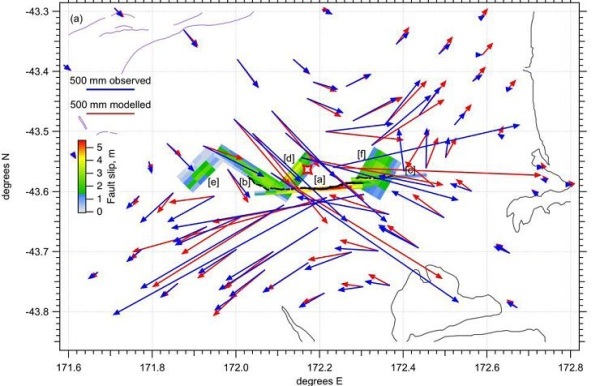 Displacements derived from this more extensive survey are shown in Figure 4. The survey results indicated significant displacements over a wide area. Close to the Greendale fault, horizontal movements of over 2m and vertical movements over a metre were measured. Across Christchurch the movements showed a generally systematic pattern, but some marks showed anomalous movements, both vertically and horizontally. These marks were generally located in areas where localized mark disturbance was suspected to have occurred due to liquefaction. The numbers of geodetic and cadastral marks affected by ground movements as a function of distance from the earthquake epicentre are summarised in Table 1. Over a million geodetic and cadastral marks are affected within 60km of the earthquake epicentre where significant ground movements occurred. The differences between the observed displacements and those calculated from the early fault model are shown in Figure 5. The model provided a good fit (except close to the Greendale fault and in Christchurch) with residuals of a few centimetres. It is expected that these could be reduced significantly by further refinement of the model, and by empirically adjusting the calculated deformation in areas where there is a clear systematic error in the modelled deformation. The model could also be enhanced with additional survey data, in particular near the fault. Areas close to the fault and areas of non-uniform deformation (liquefaction) where the model did not fit would require additional survey. These plans were well advanced until a significant aftershock struck Christchurch city on 22 February 2011. The Christchurch earthquake hit on 22 February 2011. Considered to be an aftershock of the Darfield quake, it measured 6.3 on the Richter scale. Although smaller in magnitude than the Darfield earthquake, its location very close to Christchurch resulting in massive property damage and loss of life. Particularly notable were the extensive areas of liquefaction and ground damage (Fig. 6 and 7). Following this event extensive surveys were again undertaken to quantify the extent and magnitude of ground deformation. It was clear that there were more extensive areas of non-uniform deformation and that to use a displacement model to spatially correct positions of geodetic and cadastral survey marks for this event would be more difficult. At the time of writing this paper the use of a deformation model to model this event is still being considered. However it is likely that it will not be as successful as for the Darfield earthquake and more actual resurvey of the geodetic and cadastral networks will be required in this case. 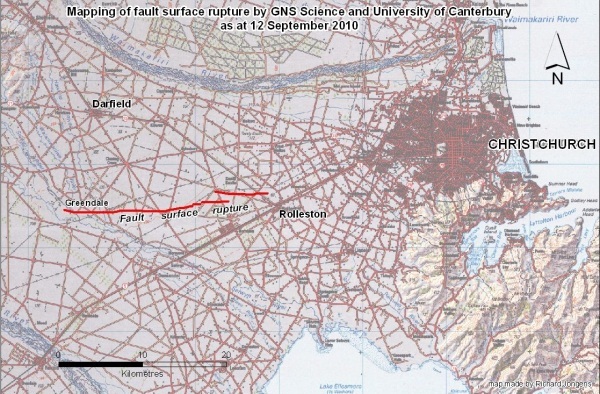 The Darfield earthquake had a major impact on the geodetic and cadastral infrastructure across the Canterbury region. 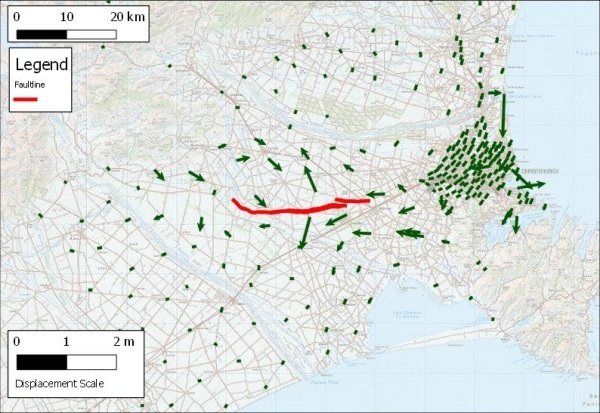 A deformation model has been developed that will be used to correct the spatial position of perhaps 90% of geodetic and cadastral marks affected by the earthquake. Areas close to the Greendale fault and where localised liquefaction occurred will require further surveys to be undertaken to correct for localised damage. 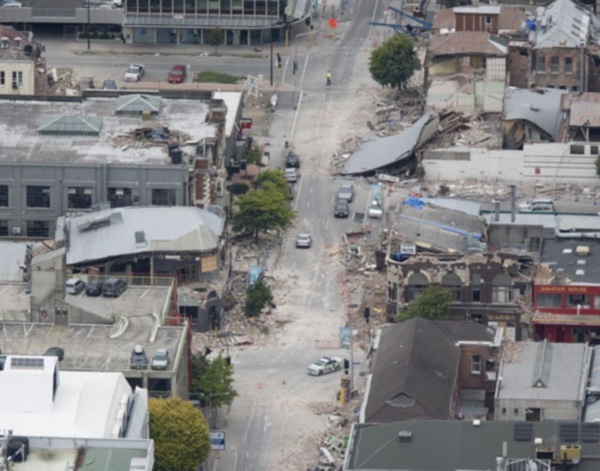 The effects of the more recent Christchurch earthquake may be more difficult to model because of the more extensive localised ground damage across Christchurch. Here, it is likely that more extensive surveys will be required to correct for the effects of this smaller but more damaging earthquake. Beavan, J, Samsonov, S, Motagh, M, Wallace, L, Ellis, S and Palmer, N, 2010, The Darfield (Canterbury) Earthquake: Geodetic Observations and Preliminary Source Model, New Zealand Society for Earthquake Engineering Bulletin, Vol 43, No 4, December 2010, pp 228-235.